Science Learning Resources seeks to improve life science literacy and raise student enthusiasm for biological sciences. A focus of the company is to leverage new Web technologies to promote learning, lower delivery costs of educational content, and bring world-class laboratory experience to students. Placing lab instruments on-line enhances distance-learning initiatives and supports the teacher's need to leverage new technologies in curriculum development and lecture delivery. Our virtual microscope product the V-Scope Explorerâ„¢ incorporates beautiful microscopic images of single celled organisms, plant cells and animal cells that help students learn basic concepts of biology and anatomy/physiology. The Biology and Anatomy/Physiology Editions cover all microscopy required for typical high school and introductory college level courses. The Butterfly Life Cycle edition address core concepts in elementary school science. Watch a student use our virtual microscope program and you know you are seeing progress! promote learning in the biological sciences. Editions of the program support traditional and online courses in basic biology, anatomy/physiology, botany, and microbiology. 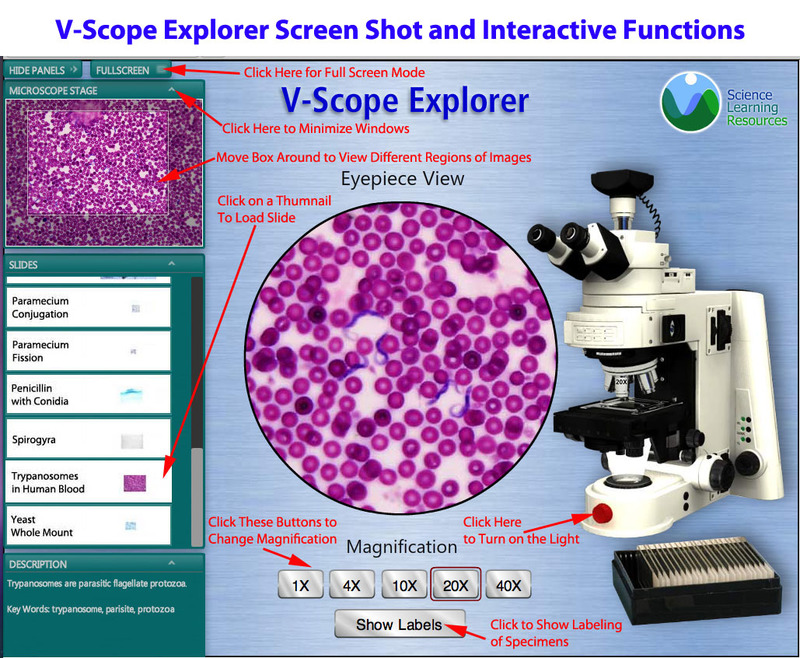 Try the V-Scope Explorer Now!